For an artist focused on creation, or a small organization of overworked staff, grant writing can seem like a nuisance at best, a mysterious other language at worst. Most grants guides are thorough, but confusing and dense with information. 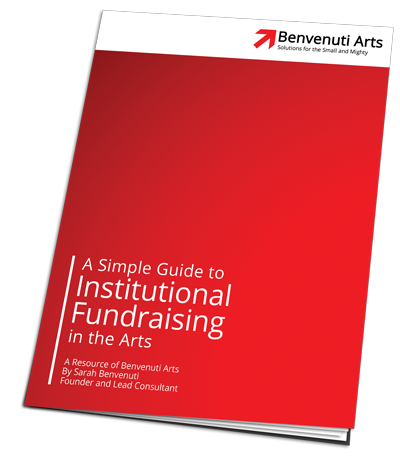 In this short, 10 page grant writing guide, you’ll find the true basics of institutional fundraising from how to choose which grants to apply for, to how to cultivate relationships with funders, to how to write in a language that actually gets you grants. This quick read walks you through the steps without overwhelming you with unnecessary information. For the beginner just learning about grants fundraising, to the veteran who can’t understand how foundations and government funders think, this guide will help you craft a lean institutional fundraising plan that makes the most of the little time you have. This form will walk you through writing a simple, 2-page LOI that you can use as an introduction to many foundations. With many specific questions and limited character counts, government grants can pose a unique challenge. Polish your storyboarding and editing skills with this form. Often, a foundation will want a more robust application than the 2-page LOI. Practice writing a longer grant with a specific focus here. Subscribe Today and Receive a FREE Individual Campaign Guide! Join our mailing list to receive a FREE Guide to running a successful individual donor campaign! By joining, you'll receive a monthly newsletter with practical tips for reaching your goals.